← One Bump or Two? In one aspect, I had felt so relieved to have made my ‘decision’, yet even though I had, I was still painfully processing the multitude of ramifications that accompanied that decision. Lorazepam got me through the day :-)….so much for going as natural as I could, haha. Some times you just have to cave. Game day came yesterday and I was treated like a princess at the local hospital – Peterborough Regional Health Centre. I immediately recognized the woman who checked me in and gave me a warm welcome. Then I was touched to discover that my Dad had beaten me there and was waiting for me, so that he could sit with my husband and I until I was called in. My sister arrived next to ensure that I had everything I needed, followed by my friend Cheryl, who was the ‘messenger’. She constantly checked in during my surgery and initial stage recovery to update my friends and family as they anxiously awaited any news of progress. As you can see in my photo, I awakened with a big smile on my face – as C had now been kicked to the curb! The first step has been completed and the rest will follow to hopefully keep it there. It did take me a couple of hours to manage to sit up and get the heck out of there though, as the first time I tried, I felt like a mack truck had hit me square on. Once I did however, it was nice to sleep in my own bed last night, without any bells, phones or nurses to wake me up ;-). Today has been good, with lots of TLC from my husband. Home Care came by this morning to check my bandages and I’m being extremely well-fed. Homemade organic soup (thank you Janis!) along with Mom’s lasagna, tuna casserole and banana bread … yum! I’m walking a little on my own already, and by tomorrow I hope to be running up and down the stairs…..well okay, maybe walking on my own up the stairs. I’ll save the running for the next day. 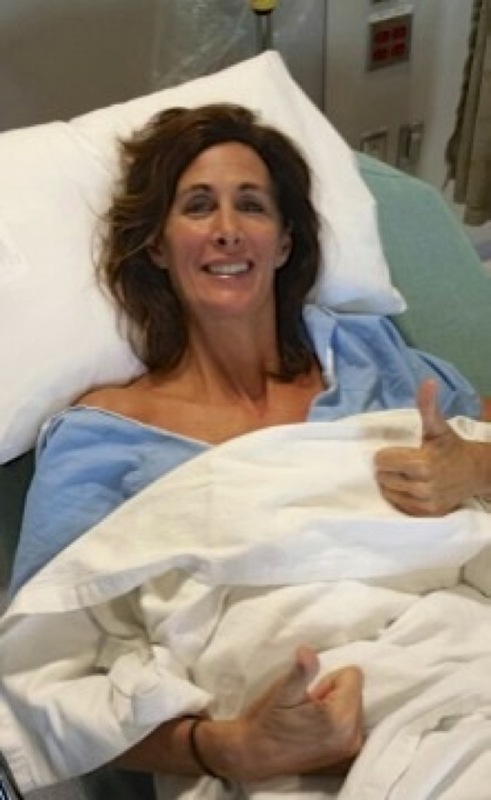 This entry was posted in Uncategorized and tagged breast cancer, Denise MacDonald, mastectomy. Bookmark the permalink. 9 Responses to Made It! Love you. You are such an amazing lady! Thank you ! You remain to have that beautiful heart felt smile. I think you are the bravest woman I know. Wow Diane, that comment surprised me – but I thank you from the bottom of my heart. It’s funny, because I don’t feel ‘brave’, I feel like I’m just bumbling along and trying to deal with it in the best way I can. I had a few people who truly inspired me and made me look deep inside to evaluate which side to be on with this. If I chose the ‘negative’ side, it would lead me to a bad place, with probably not so good of an ending. So I chose the ‘positive’ side and have amazed even myself at how that positivity turns into even MORE positivity. So I thank you for making me take the time to stop, evaluate your statement, self-reflect again and say “YES, perhaps I AM braver than I even believed :-)!” Sending you hugs and love xo. I’m amazed that you went home from the hospital the day of the surgery!! Wow!! Fantastic!! Love you!! Thank you dear Lia! Hugs! Fantastic attitude. Loving husband, Mom and friends. Lorazepam. Excellent ingredients for an excellent recovery!